MANILA, Philippines — LET RESULTS. 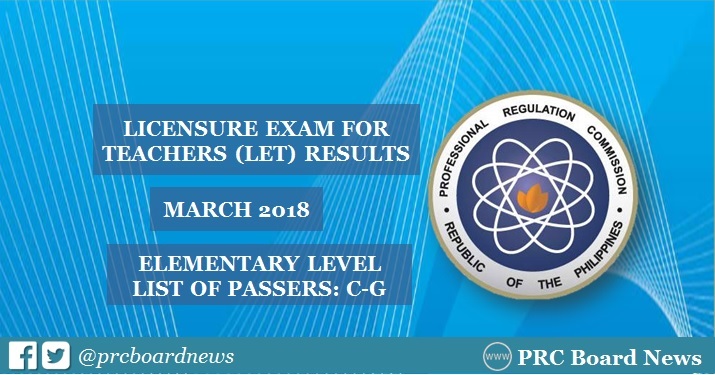 The alphabetical list of passers for March 2018 Licensure Examination for Teachers (LET) or Teachers board exam - Elementary Level is out online on Wednesday, May 23. The C-G surnames are posted on this page as the Professional Regulation Commission together with the Board for Professional Teachers (BPT) released full LET results. The March 2018 LET was conducted in at least 20 testing centers nationwide. The BPT is composed of Dr. Rosita L. Navarro, Chairman; Dr. Paz I. Lucido, Dr. Paraluman R. Giron and Dr. Nora M. Uy, Members. PRC and the Board of Professional Teachers said that in order to pass the LET, an examinee must obtain an average rating of not less than 75% and must have no rating lower than 50% in any of the tests. The agency emphasized that all passers should PERSONALLY register and sign in the Roster of Registered Professionals. Recent updates from reliable source, Carl Balita of CBRC, hinted that results are out online on Wednesday, May 23. But we advise all aspiring teachers to monitor announcement of results from May 21 to 25.